IBM Spectrum Scale helps solve the challenge of explosive growth of unstructured data against a flat IT budget. Spectrum Scale provides unified file and object software-defined storage for high performance, large scale workloads on-premises or in the cloud. Built upon IBM's award winning General Parallel Filesystem (GPFS), Spectrum Scale includes the protocols, services and performance required by many industries, Technical Computing, Big Data, HDFS and business critical content repositories. 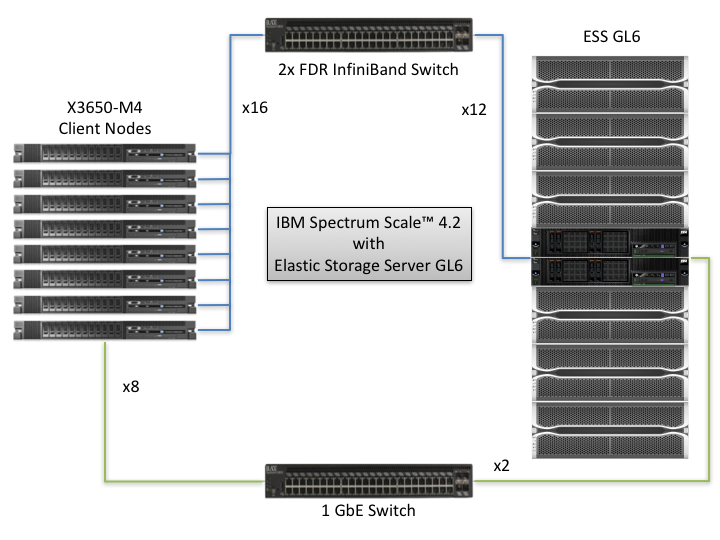 IBM Spectrum Scale provides world-class storage management with extreme scalability, flash accelerated performance, and automatic policy-based storage tiering from flash through disk to tape, reducing storage costs up to 90% while improving security and management efficiency in cloud, big data & analytics environments. IBM Elastic Storage Server is an optimized disk storage solution bundled with IBM hardware and innovative IBM Spectrum Scale RAID technology that can perform fast background disk rebuilds in minutes with no impact to application performance. This solution also ensures data integrity from the application down to the storage solution with end to end checksum and provides unsurpassed end-to-end data availability, reliability and integrity with the data efficient advanced erasure coding. 1 8 Spectrum Scale Client IBM X3650-M4 Spectrum Scale client nodes. 2 1 Elastic Storage Server GL6 IBM 5146-GL6 The ESS-GL6 contains 8247-22L IBM Elastic Storage Server nodes and 6 DCS3700E storage expansion drawers. The storage expansion drawers were populated with a total of 348 2TB 7200 RPM NLSAS drives. The ESS also included 3 optional two-port (feature code #EL3D) FDR InfiniBand adapters per server node. 3 2 InfiniBand Switch Mellanox SX6036 36-port non-blocking managed 56 Gbps InfiniBand/VPI SDN switch. 4 1 Ethernet Switch SMC Networks SMC8150L2 50-port 10/100/1000 Gbps Ethernet switch. 5 8 InfiniBand Adapter Mellanox MCX456A-F 2-port PCI FDR InfiniBand adapter used in the client nodes. 1 Client Nodes Spectrum Scale File System 4.2.0.3 The Spectrum Scale File System is a distributed file system that runs on both the Elastic Storage Server nodes and client nodes to form a cluster. The cluster allows for the creation and management of single namespace file systems. 2 Client Nodes Operating System Red Hat Enterprise Linux 7.2 for x86_64 The operating system on the client nodes was 64-bit Red Hat Enterprise Linux version 7.2. 3 Elastic Storage Server Storage Server 4.0 The ESS version 4.0 provides all of the necessary software to be compatible with Spectrum Scale version 4.2.0.3 running on the client nodes. verbsPorts mlx5_0/1/1 mlx5_1/1/2 InfiniBand device names and port numbers. verbsRdma enable Enables InfiniBand RDMA transfers between Spectrum Scale client nodes and Elastic Storage Server nodes. verbsRdmaSend 1 Enables the use of InfiniBand RDMA for most Spectrum Scale daemon-to-daemon communication. Hyper-Threading disabled Disables the use of two threads per core in the CPU. The setting was changed in the BIOS menus of the client nodes. The first three configuration parameters were set using the "mmchconfig" command on one of the nodes in the cluster. The verbs settings in the table above allow for efficient use of the InfiniBand infrastructure. The settings determine when data are transferred over IP and when they are transferred using the verbs protocol. The InfiniBand traffic went through two switches, item 3 in the Bill of Materials. The last parameter disabled Hyper-Threading on the client nodes. maxFilesToCache 11M Specifies the number of inodes to cache for recently used files that have been closed. maxMBpS 10000 Specifies an estimate of how many megabytes of data can be transferred per second into or out of a single node. pagepool 32G Specifies the size of the cache on each node. workerThreads 1024 Controls the maximum number of concurrent file operations at any one instant, as well as the degree of concurrency for flushing dirty data and metadata in the background and for prefetching data and metadata. The configuration parameters were set using the "mmchconfig" command on one of the nodes in the cluster. Both the client nodes and the ESS used mostly default tuning parameters. The parameters listed in the table above reflect values that might be used in a typical streaming environment. There were no opaque services in use. A single Spectrum Scale file system was created with a 8 MiB block size for data, a 1 MiB block size for metadata, 4 KiB inode size, and a 128 MiB log size. The file system was spread across all of the Network Shared Disks (NSDs) defined by the ESS. Each client node and ESS node mounted the file system. A policy was applied to the file system that places data and metadata on separate pools as defined by the NSD configuration. The client nodes each had an ext4 file system that hosted the operating system. The ESS was configured with two declustered arrays each containing 174 2TB NLSAS drives. The arrays were configured to tolerate the failure of any 2 drives or any single DCS3700E enclosure. Two NSDs were created using 2 64 TiB 8+2P vdisks, 1 per declustered array, and were designated to hold Spectrum Scale file system data. Two additional NSDs were created using 2 500 GiB 3-way replicated vdisks, 1 per declustered array, and were designated to hold Spectrum Scale file system metadata. Each vdisk was created within a declustered array and the blocks of the vdisk were spread across all the available physical disks in the array. The cluster used a two-tier architecture. The client nodes perform file-level operations. The data requests are transmitted to the ESS nodes. The ESS nodes perform the block-level operations. In Spectrum Scale terminology the load generators are NSD clients and the ESS nodes are NSD servers. The NSDs were the storage devices specified when creating the Spectrum Scale file system. The 1 GbE network was used for administrative purposes. All benchmark traffic flowed through the Mellanox SX6036 InfiniBand switch. Each client node had two active InfiniBand ports. Both the 1 GbE port and the first InfiniBand port were used by Spectrum Scale for inter-node communication. Each client node InfiniBand port was on a separate FDR fabric for RDMA connections between nodes. 1 SMC 8150L2 10/100/1000 Gbps Ethernet 50 10 The default configuration was used on the switch. 2 Mellanox SX6036 #1 FDR InfiniBand 36 14 The default configuration was used on the switch. 3 Mellanox SX6036 #2 FDR InfiniBand 36 14 The default configuration was used on the switch. Each of the Spectrum Scale client nodes had 2 physical processors. Each processor had 8 cores with one thread per core. Each ESS node had 2 physical processors. Each processor had 10 cores with SMT2 enabled by default. In the client nodes Spectrum Scale reserves a portion of the physical memory for file data and metadata caching. A portion of the memory is also reserved for buffers used for node to node communication. 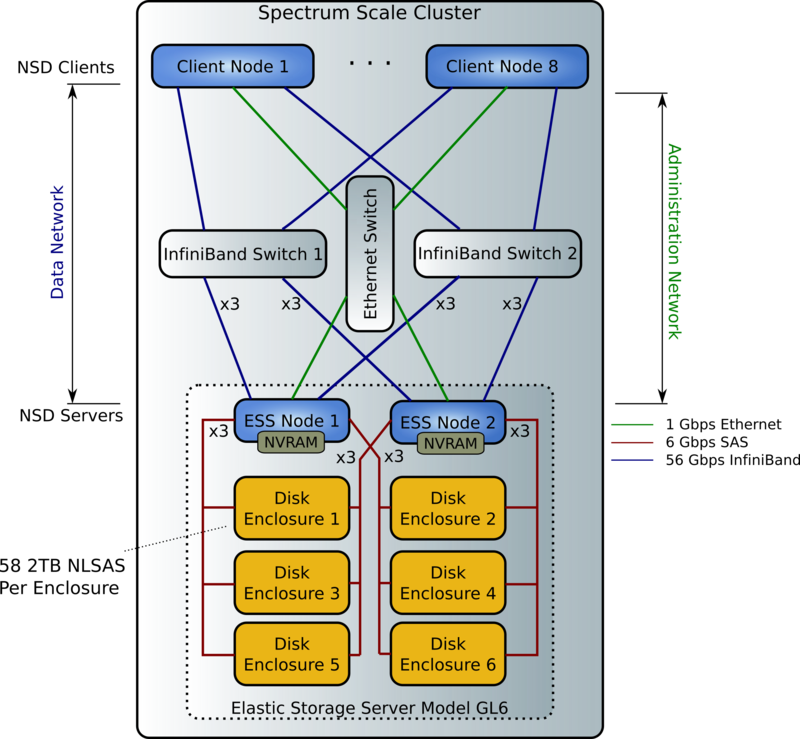 In the ESS nodes Spectrum Scale reserves a portion of the physical memory for caching block data. The integrated NVRAM module is used to store Fast Write data and some block-level log data. The ESS nodes each have an NVRAM that is used to temporarily store some of the modified data before being written to the backend disk. Modified data designated as "fast writes" are stored initially in the NVRAM, while standard modified data go directly to the backend disk. The data in the NVRAM is mirrored between the nodes. In the case of a single node failure, the write data and any destaging to backend disk is handled by the still active node. In the case of a general power outage a capacitor on the PCI card holds enough charge to keep the card powered long enough for the NVRAM data to be destaged to a stable flash medium on the card. All of the modified writes in the benchmark are handled by the ESS. 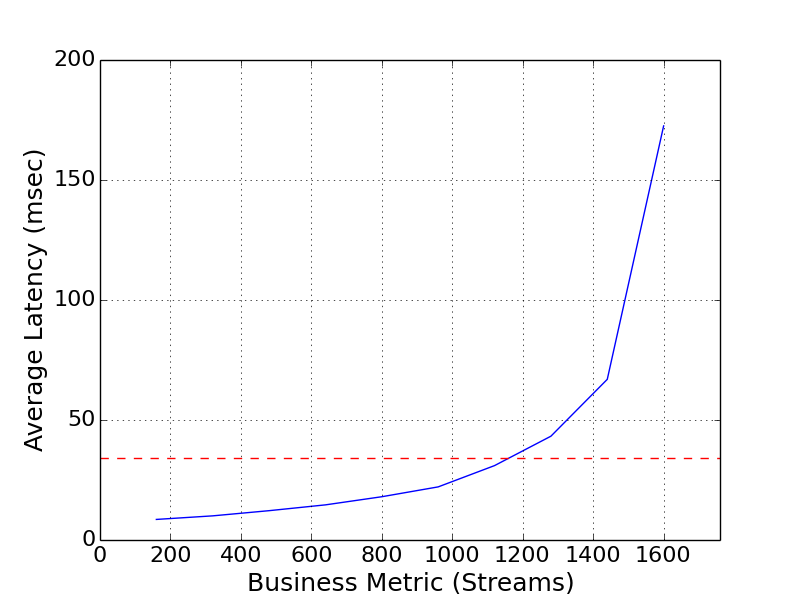 The solution under test was a Spectrum Scale cluster optimized for streaming environments. The NSD client nodes were also the load generators for the benchmark. The benchmark was executed from one of the client nodes. All of the Spectrum Scale nodes were connected to a 1 GbE switch and two FDR InfiniBand switches. The Elastic Storage Server consisted of the NSD server nodes and 348 NLSAS drives in 6 disk expansion drawers attached to the nodes via 6 Gbps SAS connections. Each ESS node had a SAS connection to each DCS3700E disk storage enclosure. Each ESS node also included a PCI attached NVRAM card. The data in each NVRAM card was mirrored between the ESS nodes, which communicated with each other over the InfiniBand network. Data protection and integrity features of the ESS were enabled during the benchmark execution. These features include disk scrubbing, NSD checksums and version numbers, double disk failure tolerance, and single storage enclosure fault tolerance. The 8 Spectrum Scale client nodes were the load generators for the benchmark. Each load generator had access to the single namespace Spectrum Scale file system. The benchmark accessed a single mount point on each load generator. In turn each of mount points corresponded to a single shared base directory in the file system. The NSD clients process the file operations, and the data requests to and from disk were serviced by the Elastic Storage Server. IBM, IBM Spectrum Scale, IBM Elastic Storage, Power, and POWER8 are trademarks of International Business Machines Corp., registered in many jurisdictions worldwide.